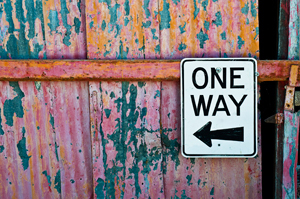 In our efforts to lead people to life change, we are essentially like signs pointing the way to Christ. For only in Jesus do we find “the Way, the Truth, and the Life” (Jn 14:6). I almost took the pious road and put prayer as #1, but I think even before you start praying for God to change someone you should remember that it is not about you. Too often Christians get caught up in thinking that they are “winning souls for Jesus” and discredit the fact that it is about God working in the lives of people to build up His kingdom. You and I are only instruments through which He can touch the lives of others. It is essential that you get this in your head before you continue. Now that you know that it is God doing the work—albeit, through you—it is time to challenge Him to be faithful to His promises, to trust that He is true to His Word. You should pray that He touch their heart, that He place other people in their path that will turn them back to God, and lastly that He use you to do it if He so chooses. And we’re talking about real prayer here, going to battle for the soul of someone else. That means you should pray for them daily, perhaps offering up a rosary, invoking the help of the saints, and even having Mass said for them. Prayer is powerful, trust me. This one is very difficult, for we live in a society that demands instant gratification. When we don’t see results we give up. But let me warn you. If you haven’t learned from your own personal experience already, God likes to work slowly. His time is not the same as our time. Nevertheless, He knows each persons heart and never gives up on them. You’ve got to be patient, even when you feel like no change is ever going to happen. It’s often right after you’re about to call it quits that God finally seems to come to the rescue. It’s easy to see the defects in those who we are leading to life change. However, it is not our place to judge them. Jesus didn’t do it, who are we to claim that right? Your duty is to love them, unconditionally. And obviously you do, or you wouldn’t be wasting your time and effort trying to help them change. When you judge them, you alienate them, you push them away. Just love them. Treat them with the dignity they deserve as fellow humans, made in the image and likeness of God. Your loving example is more powerful than any words you say. True love requires sacrifice, as Jesus showed us in His passion, suffering brutal torture and death on a cross all for our sake. Leading people to life change is a selfless act. You should be willing to fast for them. Think about something you can give up each day and offer to God on their behalf. The purpose is not to make our lives difficult, but to show that this person’s soul is that important to us. If it’s true, prove it! Many times the people who we are attempting to lead to life change are going through terrible trials. Of course, you should do what you can to help ease their burden, but I would challenge you not to dismiss the redemptive power of suffering. It is often through suffering that we learn from our mistakes, that we grow closer to God. For some people that means hitting rock bottom before they will recognize it. Although it may hurt to see, if that’s what it takes, isn’t it still worth it? Don’t give up! Remember #3 and be patient. Sometimes you may grow weary and think nothing is ever going to change. That’s the evil one trying to convince you to throw in the towel. How many times did the Israelites turn away from God? And how many times did He welcome them back? God never gives up on us, so why should we give up on those who we are trying to lead to Him? Think of the classic example of St. Monica praying for her sinner son who was to become St. Augustine. Her perseverance paid off and we are blessed to count them both as our brothers and sisters in Christ. This article was originally published at LeadersThatFollow.com.